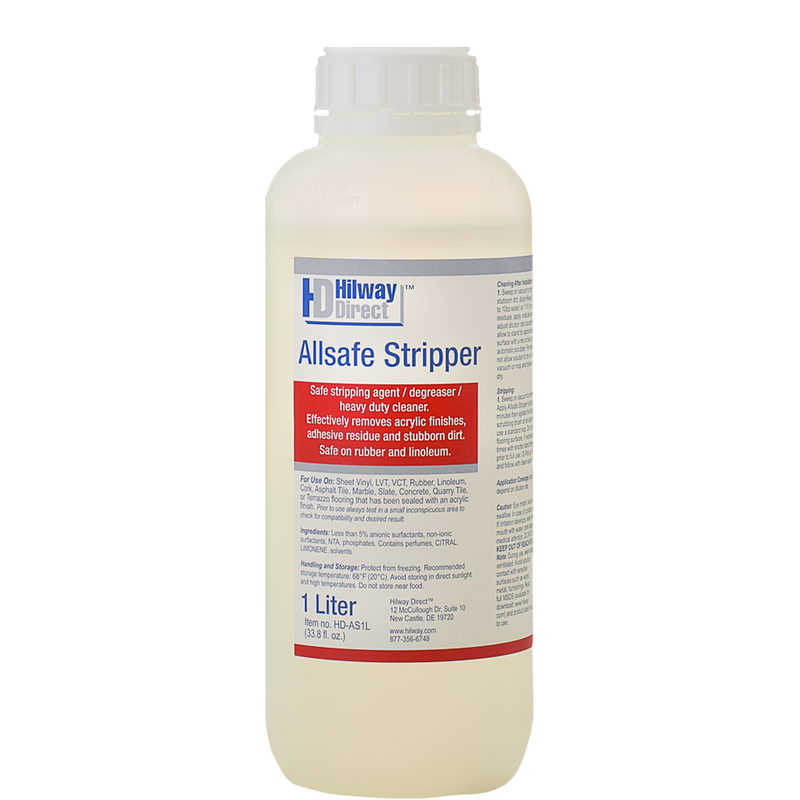 Hilway Direct Allsafe Stripper is a three-in-one stripping agent, degreaser and heavy-duty cleaner designed for safe removal of heavy dirt and floor finishes from resilient and hard surface flooring. 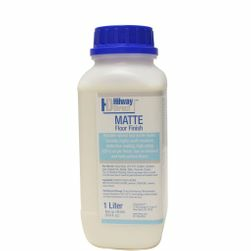 It safely strips away acrylic finishes, adhesive, dirt and grease from sheet vinyl, LVT, VCT, rubber, linoleum, cork, asphalt tile, marble, slate, concrete, quarry tile or terrazzo flooring that has been sealed with an acrylic finish. 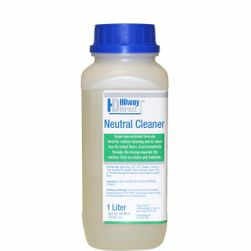 Its gentle formula is designed to deep clean and strip away residue from sensitive flooring types without damaging the finish. 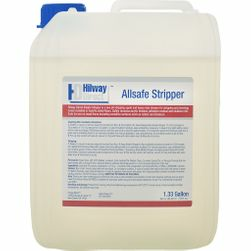 1877FloorGuy is a Hilway Direct distributor, so we're happy to answer any of your questions about this product by phone or e-mail. 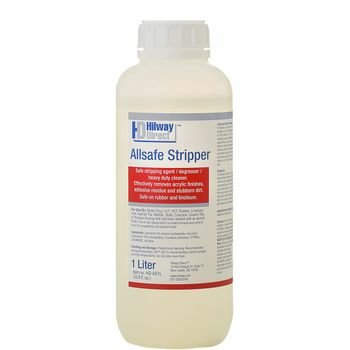 This 1-liter bottle of Hilway Direct stripper ships free via USPS. Coverage: Up to 200 square feet per 33.8 oz bottle (1-liter), depending on dilution rate. Dilute Stripper with water in a ratio of between 1:5 and 1:10. In case of particularly stubborn residue(e.g., in the commercial sector) use undiluted if required. For low levels of dirt increase the amount of water accordingly. Apply the cleaning solution to the floor. Distribute and allow to stand for approx 10 minutes. Clean the floor surface using an automated scrubber, or scrubbing brush. Take up the loosened dirt with a mop or shop vac. Mop the floor with clear water until completely clean. Residential Application: Mix stripper 1:5 with water. 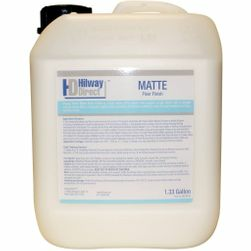 Commercial Application: Use as a concentrate or mix 1:3 with water depending on the resistance of the protective film. Before applying stripping solution, spray the floor with clear water. Apply the cleaning solution to the floor. Distribute and allow standing time of 10-20 minutes. Work in sections to prevent stripper from drying out on the floor. Prior to stripping floor covering, especially rubber flooring, check for color and material fastness in an inconspicuous area. If necessary, increase dilution ration and apply several times using a shorter standing time. Wear rubber gloves during use and ensure that the area to be treated is well ventilated. 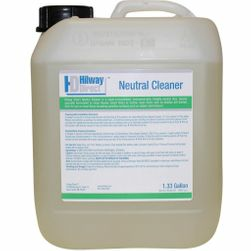 Do not spray sensitive surfaces (e.g., wood, metal, varnished surfaces) with the cleaning or stripping solution. Read full label & manufacturer instructions prior to use.